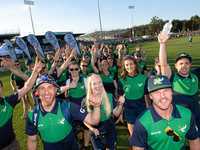 UPDATE: Australia has dominated finals day at the 2018 Tag World Cup winning the lion's share of finals, played in front of a big crowd at C.ex International Stadium in Coffs Harbour. Arguably the most exciting decider of the day came in the Boys 18s final. After trailing 8-1, Australia fought back against Australia Indigenous and levelled the scores at 8-8 seconds before the full time siren to send the match into extra time. In a five-man drop off, Indigenous scored first but Australia responded immediately with their right of reply. Indigenous scored again, as did the Australians. As fatigue set in, the pace of the game slowed slightly before the Australians grubbered ahead and regathered to score the match winning try five minutes into extra time. In the men's opens, New Zealand claimed their maiden 2018 World Cup title with an impressive win over Lebanon. The Kiwi Tag Blacks scored off the opening kick off and held the lead for the majority of the game. Lebanon hit back on either side of half time, but New Zealand were too strong in the finals minutes and held on for a 4-2 victory. In the women's opens, Australia sent champion coach Karen Smith off a winner after beating China 7-1 to claim their third straight World Cup title, while Australia were also too strong for a resurgent American Samoa side in the Mixed 21's. Ireland claimed their maiden World Cup title with a 4-2 win in the Men's 50s. EARLIER: AUSTRALIA has proven the dominant nation on home soil at the 2018 World Cup at Coffs Harbour's C.ex Coffs International Stadium already this afternoon notching up 10 finals wins across the age divisions. The finals action continues this afternoon ahead of this evening's World Cup closing ceremony. This weekend 32 nations are represented and more than 3,600 players are taking part in this the third edition of the International Tag Federation's World Cup, following the inaugural even in Auckland in 2012 and the last world cup on the Sunshine Coast in 2015. 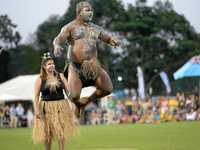 Tag World Cup Opening Ceremony: 2018 Tag World Cup opening ceremony at C.ex Coffs International Stadium.